Since its inception in 2007, Nuffnang has been one of the leading digital advertising companies today serving blogs across 6 countries, namely: Malaysia, Singapore, the Philippines, China, Hong Kong and Australia. I only became a member in 2009. Pizza Hut now offers Hot on the Dot Pizza deliveries: 30 minutes AND hot (as indicated by the thermally activated sticker you place on the pizza box upon receiving your pizza) or your pizza is FREE! It's mouth-watering when you see cheese melting on the pizza because it's delivered hot. 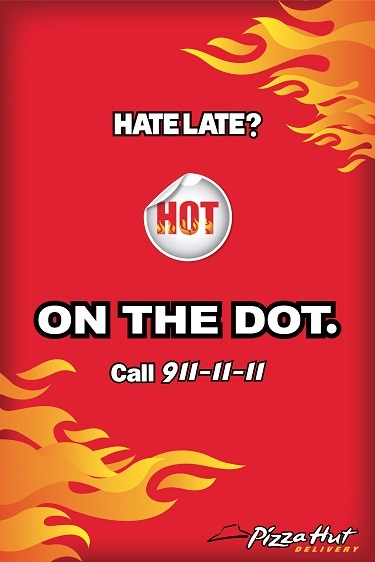 Dial 911-11-11 if you want your pizzas Hot on the Dot!